As part of its running tally of smartphone performance metrics, Tom's Guide put iPhone XS and XS Max to the test this week, to somewhat surprising results. According to the publication, Apple's just-released iPhones fared worse than iPhone X in a battery endurance test. In the evaluation, both phones continuously surfed the web over 4G LTE until their batteries ran dry. Displays were set to 150 nits of brightness with both auto-brightness and TrueTone disabled. The iPhone XS Max turned in a time of 10 hours and 38 minutes, above an industry average of 9 hours and 48 minutes, while the iPhone XS lasted 9 hours and 41 minutes before shutting down. By comparison, the iPhone X lasted 10 hours and 49 minutes in an identical test. Further, a number of flagship Android handsets sit well above this year's iPhones on the publication's battery stress test totem pole. Samsung's Galaxy Note 9, for example, browsed for 11 hours and 26 minutes before giving out, while the Google Pixel 2 XL lasted 12 hours and 9 minutes. The reigning champion is Huawei's P20 Pro, which remained operational for 14 hours and 13 minutes. A teardown this week found iPhone XS sports an L-shaped 2,659mAh battery, down from 2,716mAh in last year's iPhone X. The iPhone XS Max, on the other hand, boasts a relatively capacious 3,179mAh in a dual-cell arrangement. When Apple debuted the new smartphones this month, the company said iPhone XS customers can expect a 30-minute increase in operating time over iPhone X, while XS Max users will see improvements of an hour and a half. Today's test seemingly debunks those claims, with neither iPhone XS model reaching the battery potential of its forebear. 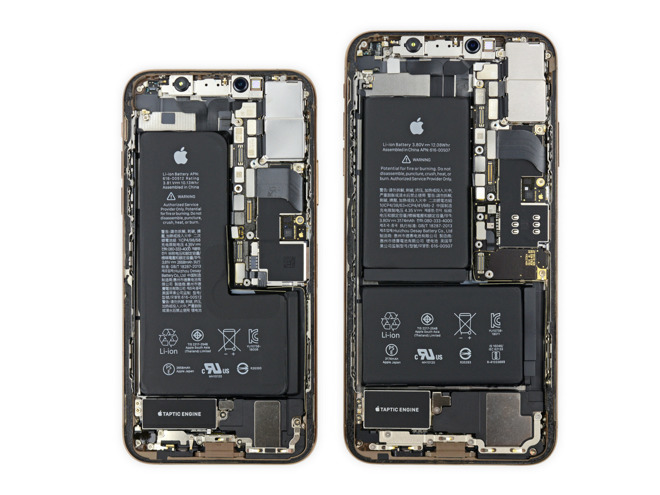 AppleInsider reached similar results in our analysis of iPhone XS Max, finding the internal battery did not live up to Apple's claims. A number of variables are at play, from operating system and app concerns to hardware optimization, though it appears Apple's estimates are a slightly exaggerated.